Aidan Hickey was born in Dublin. He studied painting at the National College of Art and English and History at UCD. On graduation, he worked as an Art Teacher and Illustrator. In 1973 he took a Post-grad Diploma in Film, at Hornsey College of Art. This led to a 30-year career in animation where he worked as a designer, storyboard-artist, animator, camera operator, scriptwriter, director, and producer. During the 1980s most of this work was for RTE, Ireland’s national broadcaster. Later he worked, mainly as a scriptwriter, for studios in Germany, France and Denmark. A number of his TV series and shorts won awards at international festivals. An Inside Job received the 1985 Prize of the Youth Jury in Annecy and the Robert Bosch Prize at Stuttgart. In 2005 he wrote and directed The Boy Who Had No Story, winning the IFTA prizes for Best Animation and Best Children’s Film. 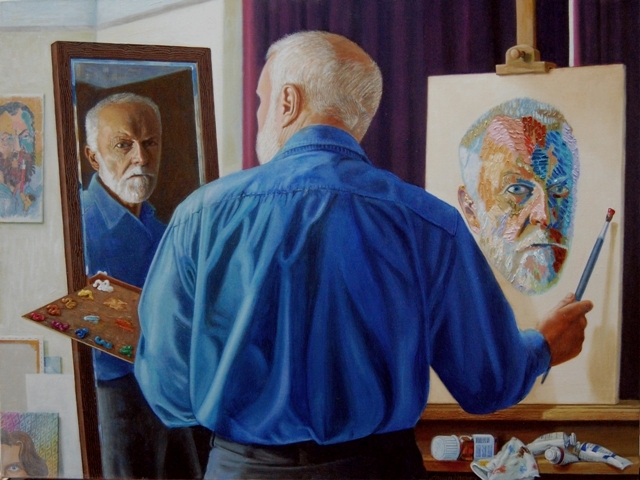 Returning to paint in 2007, he exhibited in the Kilternan Gallery, at the Bad Art in Francis Street, the Doorway Gallery, South Frederick Street and Greenacres in Wexford. Each year he exhibits with the Dublin Painting and Sketching Club, of which he is currently President. AH believes in the ancient idea of painting as visual poetry. The Greeks held that poems, like paintings, are made things, creations of the spirit and skills of humankind. We value poetry and painting because they let us see, think and feel in ways previously unknown. To achieve this, a poet chooses and arranges his/her words with infinite care. A painter uses colour, tone and shape with equal reverence. Ideally each art is an expression of what’s most meaningful or memorable in our lives.